Ticketing, SLAs, Contracts, CRM, Billing, Marketing -- without the bloat... RepairShopr is your un-PSA solution! Our integration maps your Watchman Monitoring group and alerts into RepairShopr Customers and Tickets, allowing you to get more done in fewer steps. Feed error reports into RepairShopr for one-click Ticket creation, automatically create Assets from monitored computers, all while continually updating assets with machine names, serial numbers, etc. All the features you want -- without all the confusion of traditional PSAs. Ticket Dashboard and extensive notification system keeps you on top of your asset alerts and workload. 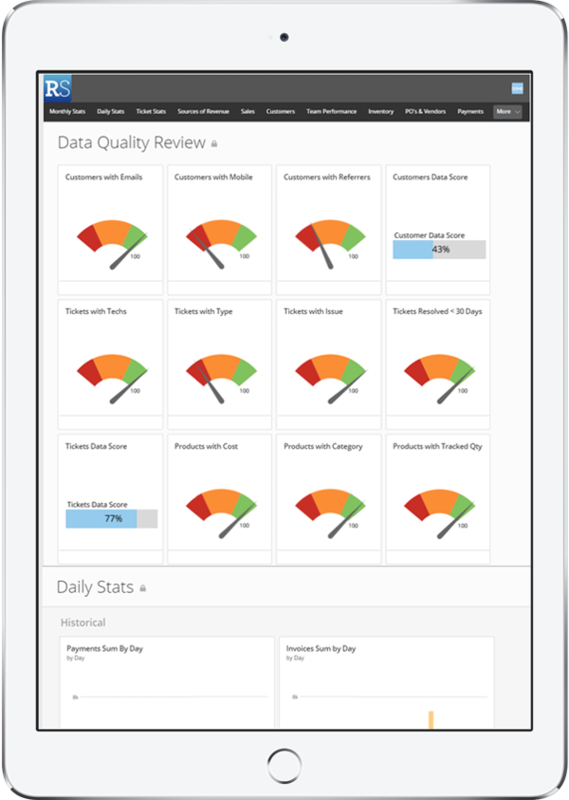 Domo add-on enables industry-best BI, analysis, and data visualization with new reports constantly added. RepairShopr integrates with your favorite products: Quickbooks, Xero, Toggl, Slack, and many more more. RepairShopr is the easy-to-use, end-to-end business management solution Watchman Monitoring users have been looking for. Attach SLAs and contracts to tickets. Define resolution time frames and escalation paths for SLA breaches with integrated tracking and reporting. Manage all-you-can eat plans, pre-paid hours, virus, backup and other subscriptions, recurring billing, and even custom contract client rates. Create tickets from Watchman Monitoring, email, portals, and website widgets while allowing your team to seamlessly track and bill their time. Keep your highest priority tasks super visible while notifications alert you by email, SMS, mobile push notifications, Slack or API webhooks. Communicate with your clients through 3-way email and integrated mobile app access any hour -- from the office, home, the road or on-site. Empower every client with their own automated portal for estimate approvals, invoice history, ticket creation, asset lists and more.